ScienceDaily (June 10, 2004) — PORTLAND, Ore. — Just six months of yoga significantly reduces fatigue in people with multiple sclerosis, but it has no effect on alertness and cognitive function, says a new Oregon Health & Science University study. The study, published June 8 in the journal Neurology, found that yoga is as good as a traditional aerobic exercise program in improving measures of fatigue, a common and potentially disabling symptom of MS. It was the first randomized, controlled trial of yoga in people with MS.
A parallel study by the same OHSU authors, presented in April at the 56th annual meeting of the American Academy of Neurology, found that cognitive function does not improve among healthy seniors in a six-month yoga program or exercise class, but physical health and quality of life appear to be enhanced. The MS study was not designed to determine the impact of yoga on the disease itself, said the study’s lead author, Barry Oken, M.D., professor of neurology and behavioral neuroscience in the OHSU School of Medicine. Rather, it was intended to determine the effect of yoga and aerobic exercise on cognitive function, fatigue, mood and quality of life among people with MS.
Study co-author Dennis Bourdette, M.D., professor of neurology in the OHSU School of Medicine and director of the Multiple Sclerosis Center of Oregon, said yoga was studied because many people with MS already are using it and reporting benefits. “We wanted to see whether or not it was beneficial when studied scientifically and how it compared with a type of exercise that physicians are more comfortable recommending — exercise on a stationary bicycle supervised by a physical therapist,” said Bourdette, chairman of the School of Medicine’s Department of Neurology and associate director of ORCCAMIND. An earlier survey of nearly 2,000 MS patients in Oregon and southwest Washington found about 30 percent of respondents tried yoga. Of those, 57 percent reported it to be “very beneficial,” Bourdette noted. 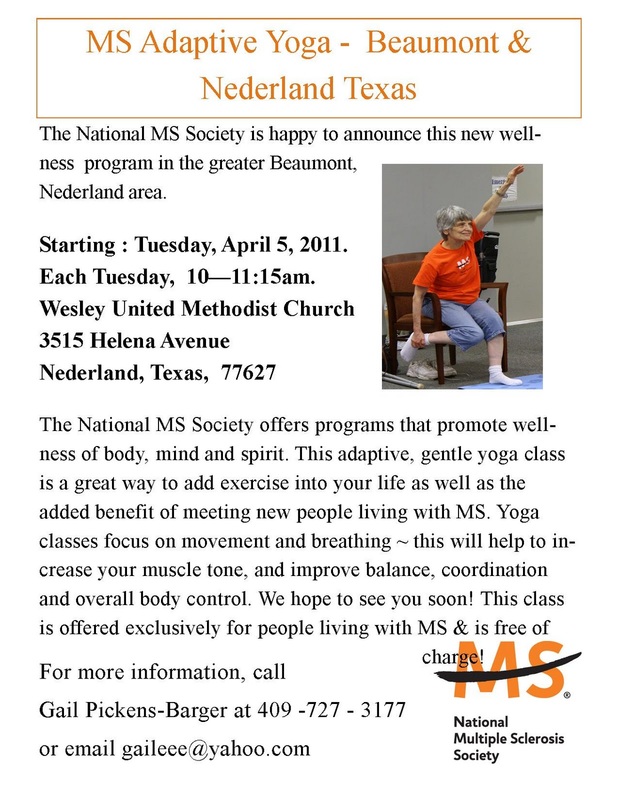 Indeed, many chapters of the National MS Society sponsor yoga programs. The study examined 69 MS patients in three groups: one taking weekly Iyengar yoga classes along with home practice; another taking a weekly exercise class using a stationary bicycle along with home exercise; and a third group placed on a waiting list to serve as a control. Participants were monitored for attention, alertness, mood, anxiety, fatigue and overall quality of life. The yoga classes were offered once a week for 90 minutes. Participants were taught up to 19 poses, each held for 10 seconds to 30 seconds with rest periods of 30 seconds to a minute. They also performed breathing exercises to promote concentration and relaxation, as well as progressive relaxation, visualization and meditation techniques. And daily home practice was strongly encouraged. The MS study’s aerobic exercise component was similar to the yoga intervention, with one class per week plus home exercise. It consisted of bicycling on recumbent or dual-action stationary bicycles, and each class began and ended with about five minutes of stretching. Participants were given exercise bikes to use at home and were encouraged to use them outside of the weekly class. While the yoga and aerobic exercise programs produced no significant changes in alertness, attention or other measures of cognitive function in MS patients compared with the waiting-list group, the study found there were improvements in two fatigue measurement tests. “We think they’re equally beneficial for symptoms of fatigue from MS,” Oken said of yoga and aerobic exercise. The study cautioned that the reasons behind the reduction in MS fatigue symptoms are unclear. The socialization aspect of the yoga and exercise classes, as well as a placebo effect — simply telling participants that the exercise program was specifically designed to improve psychological well-being — could be credited. Yoga is a type of so-called mind-body medicine that includes tai-chi, meditation, and dance, music and art therapy. It is a commonly practiced method involving behavioral, psychological, social and spiritual approaches to health, and it is centered around meditation, breathing and postures. Of the active or hatha yoga techniques, Iyengar yoga is the most common type practiced in the United States. Participants assume a series of stationary positions that employ isometric contraction and relaxation of different muscle groups to create specific body alignments. There also is a relaxation component. Whatever the workout method, exercise seems to help MS patients reduce fatigue symptoms, Bourdette said. The parallel study on the effects of yoga and exercise on healthy seniors focused on 136 participants aged 65 to 85. It showed there were some improvements in physical measures, such as cardiovascular fitness, and quality-of-life measures, such as energy and fatigue. There was no improvement in measures of cognitive function, however, compared with a waiting-list control group.